1 Pair of shoulder title badges ACF Army Cadet Force. Complete with split pins not the spike/pin type that tend to break. British Army Cadet Force (ACF) and CCF regulation shooting badge flash - unused. British Army Cadet Issue TRF. Army Cadet. ACF Army Cadet Force Cloth badge -. Approx badge height 28mm. Low start, no reserve. `F-16 ACF MULTIROLE FIGHTER`. `F-16 ACF` Aircraft Badge. The information given is from various military and civilian sources and is very comprehensive. Any amount up to 10 Badges. £3.00. r, Personal Cheque. Regulation ACF/CCF woven radio user proficiency badge (CRU) as worn by suitably qualified cadets. Features white lettering embroidered onto blue background with green overlocked border. Size: 3.4cm x 2.0cm. 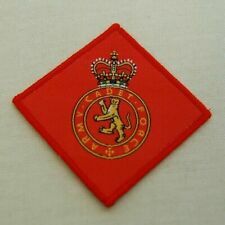 This regulation ACF Parachute Course Badge is worn by Army Cadets who have completed a relevant parachute jump course. Features overlock stitched border. Dimensions - W4.5cm by H4.5cm. Weighs - 1 gram. Colour - red/blue/black/white. Genuine - British Army Cadet Force 3 x Cloth Embroidered Shooting/Proficiency Sleeve Badge's. Overall very good condition for uniform removed examples. Genuine-2 X British Army Cadet Force - Shooting/Proficiency Cloth Badges-WW2 Era. Condition is Used. Dispatched with Royal Mail 1st Class Large Letter. Regulation ACF/CCF woven football proficiency badge as worn by suitably qualified cadets. Features gold lettering embroidered onto mauve background with scarlet overlocked border. Size: 7.4cm x 2.2cm. Army Cadet Force Parachute Course badge presented to cadets that have participated and successfully completed a parachute jump course. Scarlet and light blue woven with black and white parachute design. THIS BADGE IS UNUSUAL AS IT IS IN THE INCORRECT COLOUR FOR ITS GRADE BUT I HAVE QUITE A FEW OF THESE MAYBE THESE WERE MADE BY MISTAKE. Latest regulation miniaturised ACF Master Cadet proficiency embroidered star badge for the new MTP Personal Clothing System blanking plates (as per the Army Dress Regulations Part 8, Section 3). Size: 3.7cm x 3.7cm.